They say that any expert was once a beginner, and surfers are no exception to this rule. As a beginner, the lineup can feel intimidating. Learning to surf in a crowded lineup full of expert surfers is not ideal. Luckily, there are plenty of surf spots conducive to learning. There are several characteristics that’ll easily distinguish a more difficult or localized surf spot from any other, so recognizing which of your local beaches aren’t good for learning won’t be difficult. To ensure your own safety, don’t learn to surf in a rocky wave. This creates an obstacle course not intended for beginners, and the consequences could be brutal. Similarly, if there is no actual beach (the water is bashing up against a cliff), don’t choose to learn there. The tide may change while you’re in the water, and you don’t want to be stuck in a sticky situation. Avoiding cliffy beaches and rock infested lineups is a good call until you’re advanced enough to asses these obstacles. If the wave seems super crowded, it’s not a good place to learn. Keeping some distance from a jam-packed surf spot will keep the intimidation factor low, while also ensuring the safety of other surfers. Learning to control your board isn’t an overnight task, so make sure that you’re in control before entering a crowded lineup. A good rule of thumb is to make sure that you’re comfortable swimming out to the lineup and back. If the waves seem too big to handle on your own, then dragging a big piece of foam out with you is not a good idea. Learn to surf in small, gentle waves is much more productive than paddling out into waves that you’re not trained for. Don’t worry, your time will come. Rather than learning at a sandbar or a beach break, look for a point break. A point break will usually have multiple peaks, so you can sit on the inside and watch how the more advanced surfers ride the waves that are farther out. Additionally, a point break will be slower and gentler than a quick beach break (see point breaks, beach breaks, and reef waves later on). 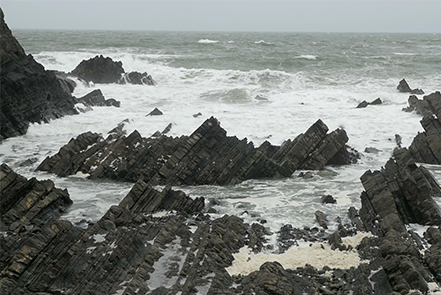 If a wave seems to be located off the beaten path, it’s probably localized or dangerous. Any wave meant for beginners will typically have information online, so you can learn about it before you go. Just because it seems like a wave is breaking doesn’t mean that it’s suitable to surf. There could be riptides or other hazards that keep surfers away – or worse, locals. Surfing a localized wave as a beginner could lead to a confrontation with some crusty old surfers, which is easily avoidable by sticking to a more ego-free territory. Now that you know what to steer clear of, you’ll find that most beaches don’t have many barriers to entry. The most common surf spots will be conducive to beginners, as long as you find the right spot to sit in. When you’re looking at a point break, whether the wave is a right or a left, you’ll be able to see that there is one main peak followed by a few smaller ones. If it’s a right, then the point will be the farthest to the right (if you’re standing on the beach, looking out), and the inside peaks will be farther to the left. Paddling to the farthest inside peak is an ideal place to learn because it will be the least crowded and the smallest part of the beach. Pleasure Point is a notoriously crowded break, but there are plenty of inside peaks for beginners to learn on. Surfers at this break expect others to be of all skill levels, so there shouldn’t be any egocentric competition between one another. This surf spot is a slow, peeling wave is a great place to practice your skills on a big beginner surfboard (not conducive to shortboarding). There are both rights and lefts, so there are plenty of waves to go around. If you find yourself on the North Shore of Oahu, you’ll quickly see that most of the waves are not at all beginner-friendly. Luckily, there is one point break called Puena Point. It’s a right and left point break, and it’s smaller than most spots on the North Shore, making it a great spot for beginners. While a point break is likely going to be the slowest and most gentle type of wave, others shouldn’t necessarily be ruled out. River-mouths, soft sandbars, and the occasional beach break may still be conducive to learning under the right circumstances. La Jolla Shores is a beach break, but it’s conducive to learning because of the designated surfing area enforced by lifeguards. This will ensure that you don’t run over any swimmers, which is a definite hazard in many beach breaks. One of the many surf spots in Byron Bay, Main Beach is suitable for beginners when the waves are small. There are lifeguards on duty every day, and the wave breaks relatively close to shore, making it a safe place to learn. 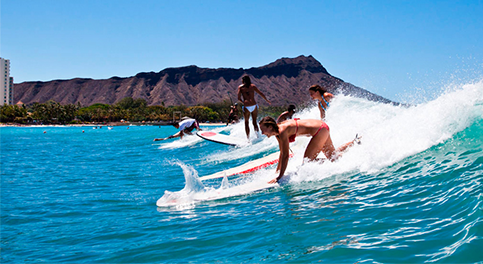 A stretch of many beginner breaks on the South Shore of Oahu, Waikiki is a beginners paradise. There are conveniently located places to rent boards, take lessons, and seek advice before paddling out. 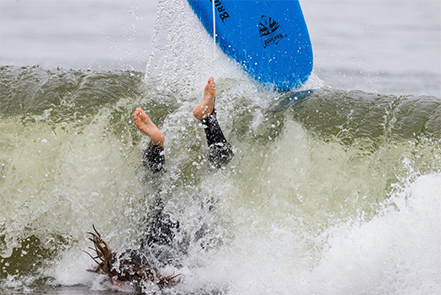 To fully understand where to avoid while learning, look into one or two of these surf spots – you’ll quickly see why to avoid crowded, rocky, competitive, or otherwise dangerous surf breaks. This wave, although it is a right-hand point break, is probably the classic California example of where not to learn how to surf. It’s packed full of experienced surfers who are competing with each other for waves, the beach is cobblestone, and the waves get huge. 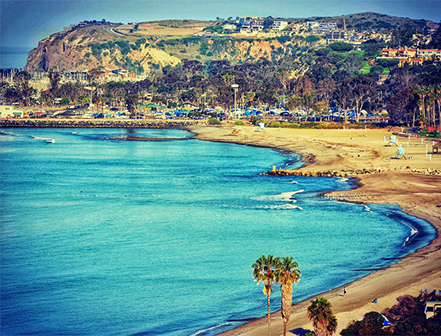 Don’t be enticed by the perfect waves of Rincon, California – you’ll work your way there soon. Another classic example of a seriously advanced wave, Pipeline is nowhere to mess around. A hollow reef that’s taken too many lives, Pipe is not a wave to be taken lightly.. quite literally – it will absolutely slam you into the reef. This is a perfect example of why beginners should avoid reefs and rocky waves. 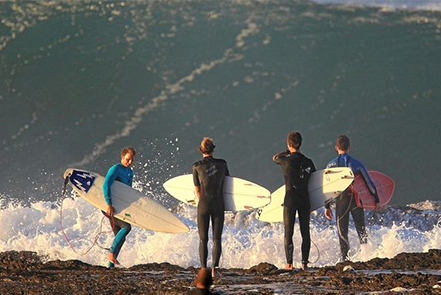 At the end of the day, the best way to find a good beach to learn is to talk to other surfers. If you don’t know many, visit your local surf shop and ask about local point breaks, or otherwise gentle waves. You’re going to have to do your research in order to find the right place, because unfortunately, an exhaustive list of every possible beginner beach isn’t quite possible. The most important thing is understanding that not every surf spot is meant for beginners and having the motivation to find somewhere that is. You’re already (at least) halfway there!